To make the rolls, dissolve yeast in lukewarm milk. Combine sugar, salt, shortening and egg in mixer bowl and mix 1 minute at low speed. Add milk mixture and mix 1 minute. Add flours and nutmeg and mix only enough for flour to be well incorporated, not more than 5 minutes. Place on greased baking sheets and pat out fairly flat. Let rise until doubled in bulk, about 45 minutes. Bake at 400 degrees for 15 minutes. When partially cool, brush with powdered sugar glaze. Makes 17 to 18 rolls. To make the cake crumb filling: combine cake crumbs, brown sugar and cinnamon, and mix well. 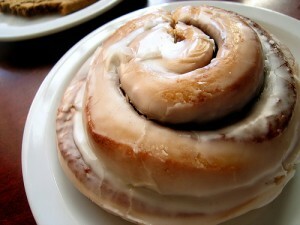 To make glaze, mix sugar into hot water until smooth. Stir in vanilla. Then call me! I’ll be right over. 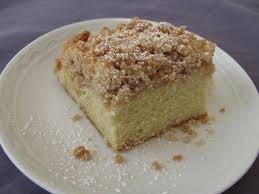 Do you remember besides the Cinnamon Rolls we also had Crumb Cake? I found this with some of my old recipes and thought you might like this one too. It is from a former Pastry Cook from LA City Schools. Now I know why we ate so well in the School Cafeteria. Unlike today, when it comes frozen and someone nukes it.....We actually had real food, homemade, and cooked from scratch......Whoa! what a concept! Combine flour, brown sugar, granulated sugar, salt, nutmeg and oil. Remove 1/2 of mixture from bowl, add 1 teaspoon cinnamon and set aside for topping. Spoon batter into greased 13x9- inch baking pan. Sprinkle with 1/2 reserved topping. Bake at 375 degrees 30 to 40 minutes.